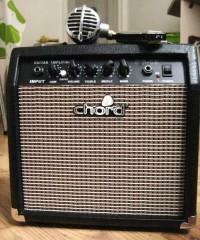 Hello Folks, Please take a look at this lovely Chord 10W guitar amplifier that sound great as a blues harmonica amplifier. Get the smooth tone with distorted edge you have been looking for to sound like all the best old blues guys. It is styled quite alot like the old Fender Champ vintage amplifiers that sell for hundreds of pounds these days. This amp doesn't only have a classic vintage style cabinet and grill it also has the vintage tones to match. Impressive volume and low feedback for such a compact amplifier. For Hi-Z blues harp use the volume, gain, treble, middle and bass controls with classic 'chicken head' controls. Comes with handy headphone socket if want to keep the volume down. Suitable for home use, recordings and small rehearsals. A great harmonica amplifier to buy for anyone that wants to be heard without giving the neighbours tinitus!